Masta's Protechmasta Infrared Therapy Leg Wraps use a naturalistic ceramic infused lining that emits a safe form of Far Infrared radiation which is a natural process and is scientifically proven to gently and safely assist blood circulation, therefore, helping to reduce any swelling in the lower leg, ease muscle tension, support recovery and help in the prevention of injury to ligaments and tendons. Set of two. 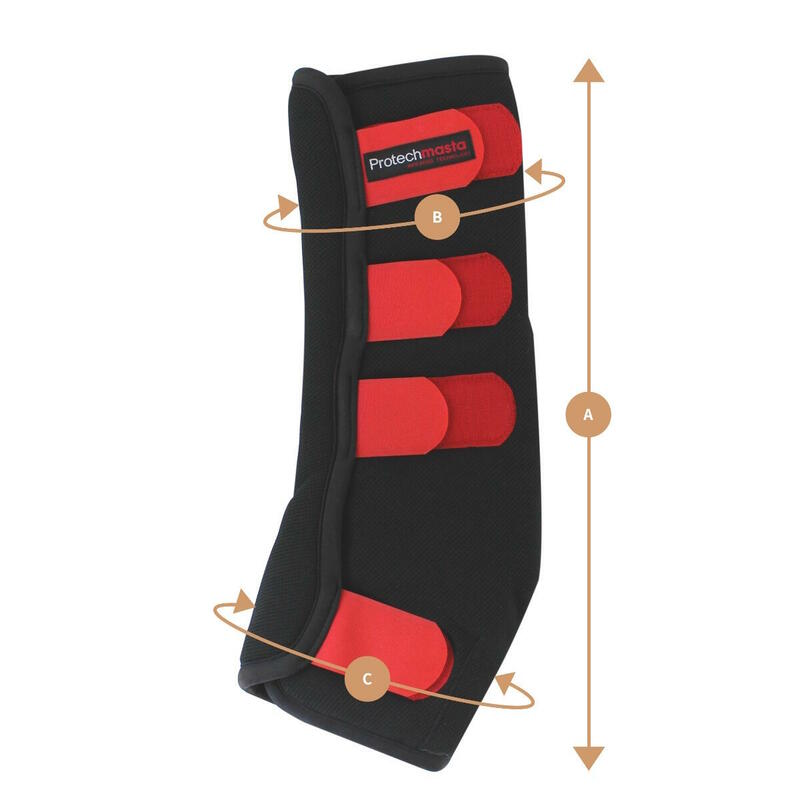 Why Use Protechmasta Infrared Therapy Leg Wraps? Fab quality and already helping our old boy - love it! Only stable boots that have kept my horses legs sound through winter. It stops his legs from swelling when stabled and keeps him comfortable. I purchased cob for my 15 hand Conni. I have been using them at night for two weeks. The first three straps are fine and fit well but the bottom strap does not fit properly and it overlaps too much so that the velcro is now getting straw etc., attached to it and will not be serviceable for long. I purchased two sets and I am very disappointed especially as they are very expensive. I will try to return them. I also purchased the rug. Not only are they top quality, but easy to use. So. Many of these protective wraps do not fit correctly and involve a lot of struggling. Only had them a week, but my horse is already feeling the benefit. Add to this the fantastic speedy delivery and you can't go wrong. Love these leg wraps, this is the second pair I have bought as they were working so well on my boy I thought our older tb could do with a pair aswell. She gets quite puffy legs when stabled overnight but these have put a stop to that. Very impressed with them. They have worn well being kept on overnight and I’m sure they would wash up as new when the time comes. Would definitely recommend. Very good quality, look hard wearing , legs seem less puffy after use. Bought the full size boots and these fit my 16.2 tb perfectly. Was concerned Velcro straps would be too short but they are fine for my boy but may cause a problem for chunkier legs. Nice light weight boots, so great to wear in stable or travel in. Haven”t had them on for the recommended eight hours yet but he will wear them overnight soon and hopefully get the full benefit of them. I have been using these whenever my horse comes in, or stays in overnight especially with the ground being hard. Always use these before and after excercise too and my horse seems to work much better. I believe that these definitely helped to speed up my horses injury to his collateral ligament. My vet couldn't believe his recovery time. Now he's are back competing. Thumbs up from me. I think the wraps are fab & they have made a huge difference to my horses legs but I think the straps should allow the fit to be a bit tighter, the Velcro on the main part of the wrap is too short. These wraps actually work and fit really well...no more cracked heels!